Are You Aware of Skimming? July 3, 2013 April 23, 2016 Sourabh Bhunje	0 Comments Are You Aware of Skimming? As we all are using ATM ‘s in our day to day life. ATM has become inevitable part of our life. Today from farmers to corporate world the ATM card are used It helps us for fast transactions but today there are certain frauds with ATM card that may lead to your asset loss. That is why care should be taken to prevent from this fraud. ONE FINE DAY IT MIGHT BE YOU. So this article describes how one can take preventive measures. What goes right now in the World? There are more than 1.7 million ATMs worldwide. About every six minutes, a new ATM is installed in the world. Annually, there are 40 billion worldwide ATM cash withdrawals. The abbreviation for ATM is: Automated Teller Machine. ATM skimming is when someone illegally copies your account details from the magnetic strip on your credit or debit card when you use an ATM. Card skimming can also happen when you use EFTPOS. The fraudster then uses your details to create a fake or ‘cloned’ card. 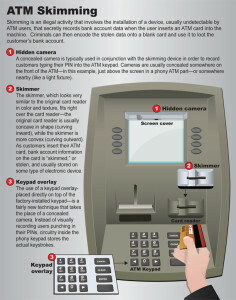 In most cases, they use the fake card and PIN to withdraw money from an ATM either within Australia or overseas. 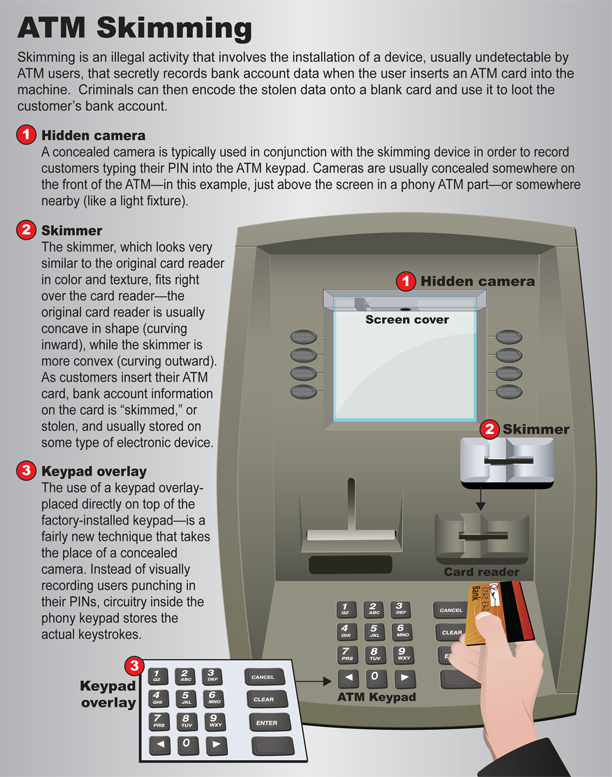 For ATM skimming, a fraudster attaches a skimming device over the card entry slot to capture your card details, and a pinhole camera above the keypad or to the side of the keypad to capture your PIN. Generally, the skimming devices are very small, well-hidden electronic devices that illegally capture your personal information when you swipe your card. For EFTPOS skimming, the thief captures your card details and PIN by replacing a genuine EFTPOS device with a tampered device which looks and works like a normal EFTPOS device. EFTPOS skimming is difficult to detect and is often not identified until we, or you, find irregular transactions on your account or we find that several affected customers all used the same merchant. Pull on the card slot: Card stealers can’t spend a long time messing with an ATM, so card skimmers are often easy to install and remove. If the card reader at the ATM moves or seems loose, don’t risk it. Hackers are getting smarter though, and technology to enable more advanced and harder to detect skimming devices is becoming more widespread (e.g. 3D printers, tiny cameras that can record PINs through a pinhole. So how are we, consumers, supposed to detect all of this? ATMs themselves vary greatly bank to bank, country to country. Sometimes, even same banks will use multiple different ATMs, and anti-skimming fascias might be different altogether. Consumers may not be able to tell that a machine has been compromised. Banks may not know either. Hackers might have super-glued overlaid keyboard and the skimmer, the camera can be so tiny and hidden so well it would be nigh impossible to detect, or the complete circuitry (reader, camera, the whole shebang) extremely well disguised to look nearly identical to ATMs original fascia. What Can Bank do to Protect Account from ATM Skimming? Detect if someone has attached a skimming device to an ATM — if so our Security Hotline will be immediately notified. 2. Monitor and analyze your transactions 24 hours a day — if a suspicious transaction is found, then one of our fraud analysts will contact you to confirm the transaction and prevent any further losses. Always cover your hand when you enter your PIN so that if there is a camera, the numbers cannot be captured. 3. We also constantly monitor both local and international fraud trends to make sure we are aware of the latest scamming developments. Plus, if your debit card is skimmed, we guarantee to refund any fraudulent transactions that take place within five days from when you report the incident to us. Warning signs — what should I look out for? 1. Does the ATM look like it normally does – can you see any unusual additions, marks or changes? 2. Are there any signs that someone has tampered with the ATM – can you see any glue residue, exposed wires, pieces of double-sided tape? 3. You notice something suspicious about the card slot on an ATM (e.g. an attached device). 4. A shop assistant takes your card out of your sight to process your transaction. 6. A shop assistant swipes your card through a different machine to the one you used. 7. You notice unusual or unauthorized transactions on your account or credit card statement. 8. Check your accounts regularly to make sure there are no unusual or unauthorized transactions. Kurt Helwig, executive director of the Electronic Funds Transfer Association, says ‘Criminals are willing to invest some time and money in skimming frauds because of the potential bounty’. ADT information source says that, in 2008 there were more than $1 billion was stolen in ATM-related crimes. Always pay attention to objects mounted on the ATM machine or located nearby if any. This is the direct version of phishing scam. Be aware if a shop assistant looks like they are going to take your card out of your sight, and ask them if it is really necessary; in this case you should ask for your card back straightly and either pay with a cheque or cash, or do not make the purchase, search another secure shops. If you think you had skimmed just don’t only your financial institution, but also call your local police.